With the launch of the GRACE Follow-On twin satellites in 2018, the fundamentals and details of Satellite-to-Satellite Tracking (SST) measurements between low Earth orbiters find a lot of interest these days. The low-low SST technique was very successfully pioneered by the GRACE mission (2002-2017). The pair of satellites of GRACE Follow-On, a joint NASA/GFZ mission, carries two independent and complementary SST systems: the well-proven micrometer precision K-band system of GRACE, and in addition, an experimental laser ranging interferometer with even higher precision. The mission has recently completed its In-Orbit-Calibration phase, and science data are scheduled to be publicly released later in 2019. They will be used by research groups all over the world for the recovery of the time-variable gravity field of the Earth and for the determination of large-scale mass redistribution in the Earth system, a task that is now also addressed by IAG’s new Combination Service for Time-Variable Gravity Field Solutions (COST-G). The mathematical approaches for gravity recovery from SST data have been addressed by the international Wilhelm und Else Heraeus autumn school “Global Gravity Field Modeling from Satellite-to-Satellite Tracking Data” held from October 4 to 9, 2015, in Bad Honnef, Germany. 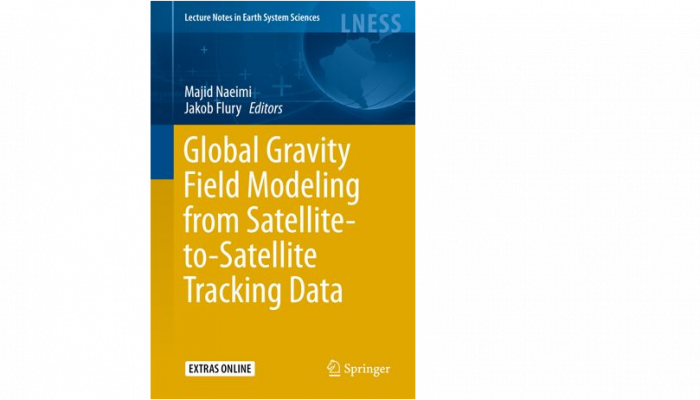 The lecture notes of the school, written by leading authors on the field, have been collected and published under the same title as Springer Earth System Science Lecture Notes, edited by Majid Naeimi and Jakob Flury. The approaches addressed are the acceleration approach, the energy balance approach, and the classical or variational approach. In addition, the related subjects of orbit determination and parameter estimation are included. All data and programs for the exercises of the school as well as their solutions are available in a supplementary online repository. In January of this year, at the workshop of the COST-G working group at ISSI in Bern, I had the pleasure to present the book to Richard Biancale (CNES/GFZ). He passed away – out of the blue – three weeks later, on Feb 4, while skiing in the Bavarian Alps. Richard was very important in advancing our field in many ways, being strongly involved in international scientific collaboration. Let’s continue his legacy and honor his merits. We miss him. Congratulations again to Sara Bruni for receiving the Geodesy Division Outstanding Early Career Scientist Award 2018! A summary of her research on new findings in the gravity field time series from Medicina is posted below. Maybe you know an Early Career Scientist who does as outstanding work as Sara Bruni does? 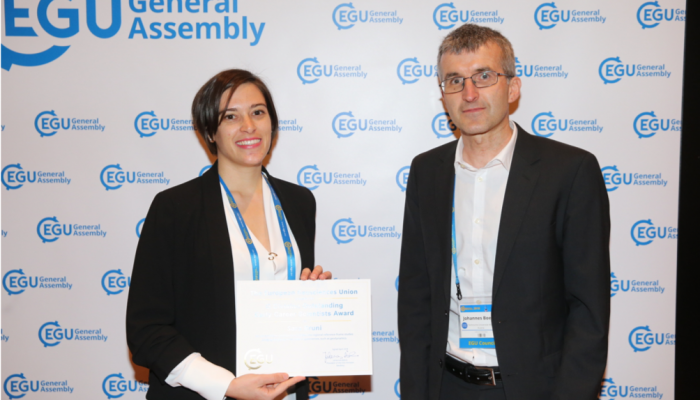 Nomination is the first crucial step in order to receive an award, don’t let this opportunity pass and nominate an outstanding colleague for an EGU Award or Medal in 2019, the final nomination submission deadline is June 15, 2018! View of the Medicina observatory. The site hosts a superconducting gravimeter (SG) installed in a dedicated building next to a piezometer. Local height variations are monitored by means of two GPS stations, located at the end of the N-S segment of the “North Cross” radio telescope. 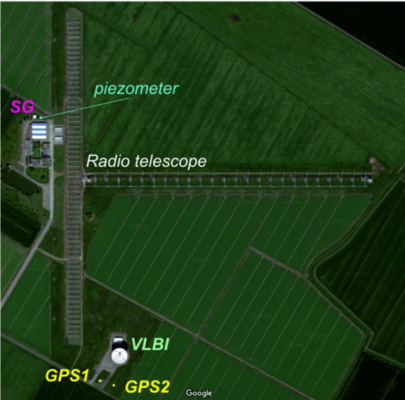 The two GPS stations are about 30 m apart and are close to a VLBI antenna. Geodetic observations have proven to provide a fundamental base for advances in Earth-system sciences, while simultaneously supporting critical societal applications such as navigation, land planning and disaster management. However, the interpretation of geodetic records is far from being a trivial task. The available observables typically respond to multiple geophysical phenomena; in turn, these phenomena can span over various temporal and spatial scales and can involve mass transfer and energy fluxes between the different parts of the system Earth. Therefore, one of the most exciting challenges that geodesy is currently facing concerns recognizing the fingerprints of different geophysical processes in the available observations. In our recent talk at the EGU General Assembly, we focused on results derived from 20 years of continuous height and gravity measurements acquired at Medicina, Italy. Gravity data are well-suited to illustrate the complex interplay between different processes because they embed the effects of both mass variations and crustal deformation. Our study aimed to characterize the different contributions to the gravity data and quantitatively assess the agreement between independent observing techniques. Thanks to the wealth of data collected during all these years, we were able to conclude that the gravity behavior in Medicina is mostly governed by the natural land subsidence and by regional non-linear variations in terrestrial water storage. For the first time, we have managed to quantify the temporal variations of geo-technical phenomena controlling the soil response to variations in surface fluids. As these phenomena can induce damages to the walls of buildings such as, for example, residential structures, any improvement in their understanding has also a valuable societal impact. By carefully modeling all the relevant components, we were able to reproduce gravity data with an overall agreement in the order 10 nm/s^2. The long-term and effective collaboration between the Department of Physics and Astronomy of the University of Bologna and the German Federal Agency for Cartography and Geodesy made this experiment possible. There have been many challenges to overcome during the journey, but the insights revealed after (the first!) twenty years of operation tell us about a successful geodetic story. 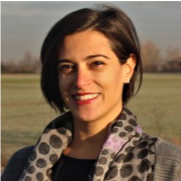 Sara Bruni is the recipient of the Geodesy Division Outstanding Early Career Scientist Award 2018 and a post-doc researcher at the Department of Physics and Astronomy of the University of Bologna, Italy. 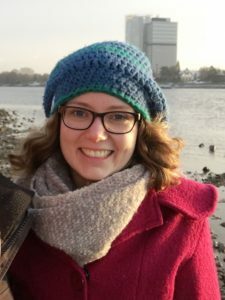 Her research interests include the combination of space geodetic techniques for the realization of the ITRF, sea-level studies in the Mediterranean area and the separation of signals in gravity dataset. You can contact her at sara.bruni4@unibo.it. One day in January, we heard it through the grapevine that we were supposed to submit abstracts to an event called EGU. So we asked ourselves: What exactly is EGU? 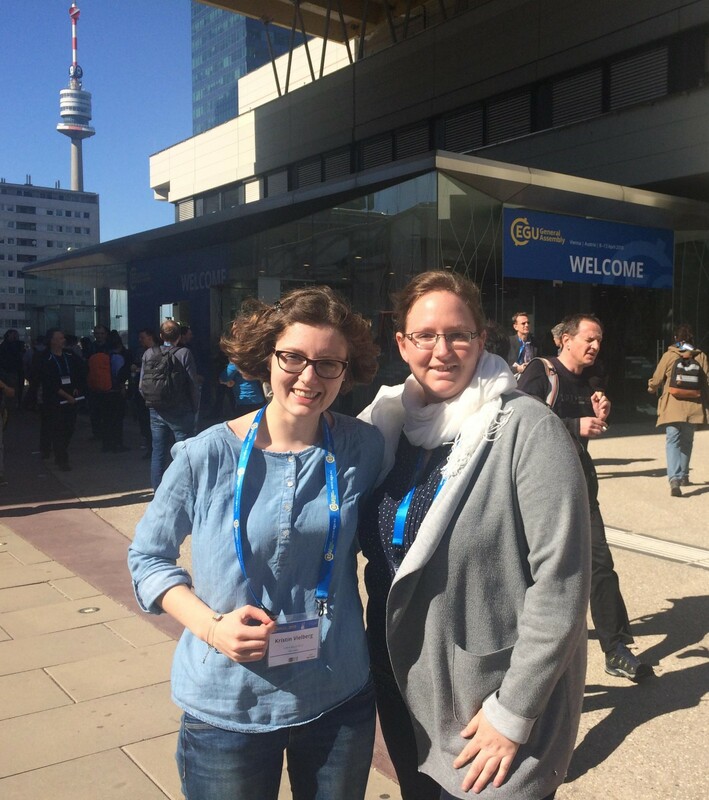 Our colleagues told us: ‘EGU is a huge, international conference worth going. And you will have a lot of fun.’ So we submitted our abstracts and hoped for the best. Three months later, we entered the airport with a poster box and some of our colleagues. Immediately, the excitement started seeing at least 20 poster boxes on the same flight. But our flight got canceled. So, instead of joining the ‘Opening Reception’ in the evening, we practiced queuing (which was helpful later for coffee and beer at EGU) at the airport. Luckily, we got a new flight and finally arrived in Vienna late at night. So we went two floors up to attend the first session with an incredibly long name and the letter combination ST3.5/EMRP4.33/G4.4. This weird abbreviation turned out to be a joined session of three divisions: Solar-Terrestrial Sciences (ST), Earth Magnetism & Rock Physics (ERMPS) and Geodesy (G). This was totally Kristin’s topic, but Kerstin left after the first oral presentation to make her way to a HS session (Hydrological Sciences). Sometimes it is really hard to decide where to go, since there are always plenty of interesting sessions at the same time (666 in total!). When in the late afternoon the queues for beer and wine got really long (which we already knew from the airport), it was time for the poster session. It surprised us that presenting our research was a lot of fun as we gained new research ideas and met interested people. However, we felt very exhausted after the poster sessions due to the low signal-to-noise ratio (incredibly loud and incessant noise). By the end of our first day, we were more or less familiar with thousands of new abbreviations related to the conference itself and also to different research areas, e.g. GW is either used as groundwater or gravity wave. And after this first day of confusion, the EGU-app and even twitter turned out to be really helpful to schedule our time. During the week, we also learned to appreciate the name badges as they were sometimes really helpful, when you accidentally run into famous people in your research area, who you have never met before. While attending short courses like “Rhyme your research” or “Serious games for Natural Hazards”, we met people from other disciplines as well. To survive the amount of input, we spent highly needed breaks in the sun by the river. During the breaks or at dinner, it was also great to catch up with new and old friends from summer schools etc. BTW, the food in Vienna is absolutely stunning. Furthermore, we totally loved the Imaggeo photo contest – the pictures we voted for actually belonged to the winning pictures. Another must-see – at least in geodesy division – was the medal lecture on Thursday evening. We will definitely come back next year! And the first thing Kerstin installs on her new mobile, is Twitter. Kristin Vielberg is a PhD student at the Institute of Geodesy and Geoinformation at the University of Bonn, Germany. Her research is on force modeling of satellites with the aim of better understanding the coupling of the thermosphere and the ionosphere. You can contact her at vielberg@geod.uni-bonn.de and her twitter handle is @KManyMountain. 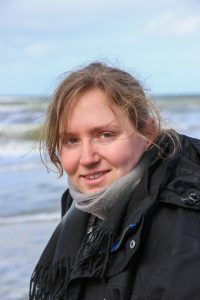 Kerstin Schulze is a PhD student at the Institute of Geodesy and Geoinformation at the University of Bonn in Germany. She studies the assimilation of multiple data sets, including satellite and in-situ observations, into hydrological models. You can contact Kerstin at schulze@geod.uni-bonn.de and her twitter handle is @KExploringEarth.